One somewhat tedious but vital step whenever you assemble a computer is to connect all those little wires for the front-panel switches, system speaker, USB ports, and indicator LED's from the case to the motherboard. If you purchased a "barebones" computer with the motherboard already installed, then more than likely these connections were done for you already. If you purchase a barebones kit, then maybe not. Of course, if you designed and are building the computer from scratch, you'll have to make the connections yourself. Hopefully, you have good eyes and can read the tiny lettering on both the connectors and the motherboard. Otherwise, break out the bifocals or a good magnifying glass. Each switch and LED on the front panel has a wire lead attached to it with a connector on its end that must be connected to the appropriate headers on the motherboard. Some of the connectors (especially the LED's) are polarized, meaning that they have to be connected in the correct polarity. Polarized connectors have a tiny arrow or a plus sign by the positive wire, but no keyway to prevent you from attaching them backwards. If they are connected backwards, they won't work properly (if at all); but usually they won't be damaged. Most cases have leads for the system speaker (the one built into most cases that beeps when the computer passes POST), the power switch, the reset switch, the hard drive activity LED, the power LED, and sometimes a few others. The leads for the LED's must be connected in the proper polarity. The rest should be connected in the proper polarity for the sake of doing things professionally, but they will work even if they're attached backwards. If one of your LED's doesn't work (or if it stays lit all the time or is the wrong color), chances are that you attached it backwards. Reverse the polarity of that connection and see if it fixes the problem. Unfortunately, there's no universal rule about where the headers will be located on the motherboard. 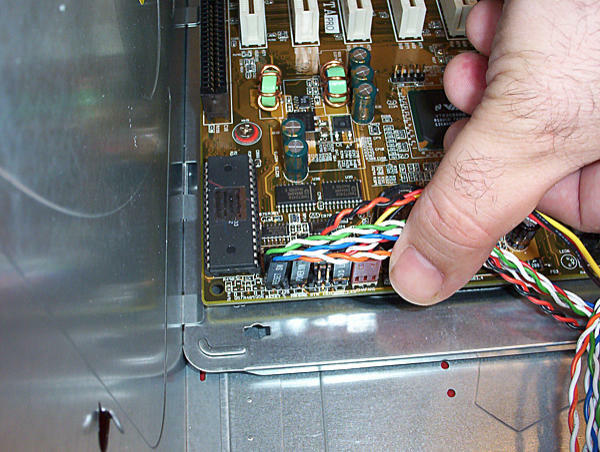 To find the correct headers to attach the connectors to, you will have to consult the motherboard manual or look for the teensy lettering on the motherboard adjacent to the pins. They usually use pretty obvious abbreviations such as "SW" for the power switch, "PWR" for the power LED, "HDD" for the hard drive activity light, "SPK" for the system speaker, "RST" for the reset button, "USB" or "F_USB" for the USB ports, and so forth. Finally, there almost certainly will be some headers for which your case has no corresponding wires. Those are either diagnostic ports or headers for features that your system doesn't have. Just make sure to find the correct header for every wire. Don't worry about not having a wire in every header. 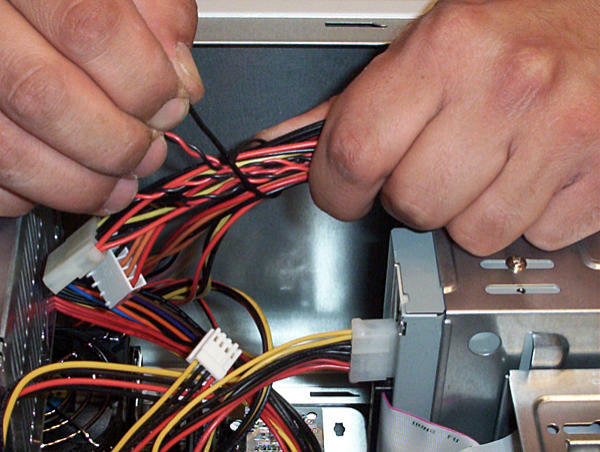 One of the signs that a computer has been assembled in a professional manner is that any extra wires are tied off and secured out of the way so they don't rattle around inside the case, short out against the metal parts of the computer, or interfere with the fans. The most professional way to do this is with small plastic wire ties. A less-professional, but equally effective way is to use electrical tape. Never use metal twist ties (which can cause shorts) or cellophane tape (which can loosen up and fall off over time). If you fail to secure the wires, and one of them gets caught up in the processor or chipset fan and causes it to stop spinning, it can cause that part to overheat and be damaged beyond repair within a few seconds to a few minutes. If one of the extra power connector cables shorts out against the case, it may instantaneously destroy the power supply. And if a spare power lead shorts out against a component, it may very well destroy that part, as well as the power supply. The moral of the story is that even though tying off the wires is a simple job, it's still an important one that has to be done right. Don't get lazy now after all the work you put into your homebuilt computer. Tie off those extra wires. Your computer is now assembled and ready to come to life. Congratulations! Before firing up your new computer, take a few moments to double check the following items. Overlooking some of them could result in serious damage to your new computer. Everything checks out okay? Great! Now comes the moment of truth: Get ready to start up your homebuilt computer for the first time!